Possession of cannabis is technically illegal in Canada, so avoid holding in public. Medicate before you head out, or at least medicate before you enter any establishment. I suggest vaping to cut down on the odor. You might be asked to leave if you reek. The decision to use cannabis is entirely on your shoulders. Toke wisely. Be respectful of businesses and other customers. Transit is your friend. With the new Compass Card system, you don’t even have to make eye contact. Needless to say, get your Compass Card sorted out before you get high. You won’t be able to figure out those Compass Card vending machines if you’re stoned. Plan ahead. Make sure you’ve figured out exactly where the place is before you head out. When in doubt, takeout. I’ve chosen places that require minimal interaction when ordering and eating your food. If you feel things are getting a bit too intense for you, get the food to-go and enjoy in the comfort of your own home. I know this might be impossible but focus on your mission. You’ll be easily distracted along your journey. Just get your food first, then you can stare at your hands all you like. Also recommended are the Tempura Fried Oysters (the textural contrast between the crunchy batter and the pornographic insides will make you moan) and the Pad Si Ew Beef Noodles (the springy, chewy rice noodles are a joy to eat). They have one of the most balanced bbq sauces around. You’ll spend 10 minutes just licking every drop from your fingers. They also have pulled pork, brisket, and fried chicken. Their Bucket of Fried Chicken has a light, wispy coating and is on special every Friday for only $20! My last pick from New West River Market is the Thai Rotisserie Chicken place, Freebird Chicken Shack. This might be one of the more difficult meals to manage because you have to use a fork and deal with chicken, rice, and papaya salad, as well as choose between the five available sauces. I’d just go with the sweet/salty/sour/spicy Nam Jim Jaew or the slightly sweet Fermented Soybean & Pickled Garlic sauce. If you’re a chili-head, by all means go for the Mom’s Spicy Sambal and strap yourself in for a wild ride! This meal will take some effort to eat while high, but the rewards of combining the roasted, juicy, subtly seasoned free range chicken with rice and sauce in your mouth are well worth the effort. Bonus mission: take a 15-20 minute walk along the river towards Steel & Oak Brewing to reward yourself for debunking the myth that stoners are lazy. Lazy mission: Spud Shack tucked inside New West Skytrain Station. All kinds of loaded poutine and craft beer. For sheer convenience, value, and flavour, nothing beats a banh mi (Vietnamese sub sandwich). One of the better and more satisfying ones out there is the Ducking Good Banh Mi from Che-Licious on Denman St.
Chinese BBQ duck is one of our city’s most treasured foodstuffs, and putting a decent amount of it into a banh mi is “a good thing”. Also recommended are the Heo Yeah! crispy roast pork banh mi and the Pork Bomb Salad Roll — all easy to grab before you head to the beach to get fucked up. Their baguette has a thin crackly crust and airy crumb. The fillings are generous and I love the soft and chunky siu mai ground meat mixture. The combination of tastes and textures with the pickled veggies and smooth, rich lard/mayo will set off fireworks in your mouth. Also recommended is the flaky pate chaud (puff pastry filled with ground pork) if you get there early enough to grab some. There really isn’t any good place to eat your food here (not even the lame Jones Park down the block), so this is probably best eaten at home. Bonus mission: Buy a vegetarian banh mi from Banh Mi Saigon, then head across the street to the filipino Hapag Ihaw Ihaw and buy a Crispy Pata (deep fried pork hock) for the crunchiest, most glass-like crackling and tender, gelatinous meat you’ve ever seen. Stuff the pork inside the sandwich and pour the vinegar dipping sauce over top for master-level stoner foodie points. The Rio Theatre is conveniently located near Broadway/Commercial Skytrain Station, and serve craft beer and grilled cheese sandwiches, making it a stoner foodie’s paradise. With movies like Anomalisa, Being John Malkovich, and Willie Wonka & The Chocolate Factory, it’s practically rolling the joint for you! Speaking of grilled cheese, if you find yourself high and in Gastown, check out the Hi-Five grilled cheese takeout window on Cordova near Carrall. With a sandwich called “Yes Ma’am” that contains mac ‘n cheese, you know their whole menu was developed after a big smoke-out. Bonus mission: If it’s before 10pm, head over to Soft Peaks for soft serve ice cream with the thickest mouthfeel ever. If you find Soft Peaks’ base ice cream a bit too bland, try UYU for soft serve that’s a little sweeter. Located to the right of Campagnolo, Upstairs at Campagnolo gets huge marks for their famous Dirty Burger made with in-house dry aged beef neck meat served on a crusty scotch bap bun. Even if the burger is sold out (which happens often), there’s still an ever-changing menu of booze-friendly snacks to please the stoner carnivore in you (think jerky, crackling, bbq spiced pork ribs, even whole pig tails). Just be REALLY careful going up and down the stairs, and don’t let the Twin Peaks-esque hallway to the washroom freak you out. This one-two punch combines fantastic NY/Neapolitan-hybrid pizza and 24 taps craft beer: Pizzeria Farina and their next-door neighbour The Boxcar. The Boxcar is a rarity in Vancouver, a bar in the truest sense of the word because it doesn’t have food service. But they let you bring in pizza from Pizzeria Farina next door. Best of both worlds! 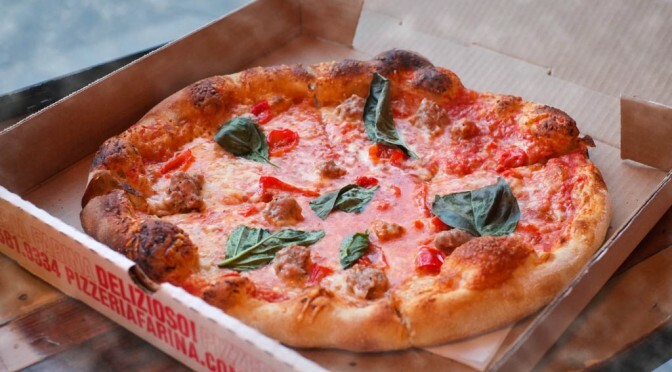 If you had to choose just one pizza, get the Finocchiona. A mind-blowing combination of sauce, cheese, sausage and sweet hot peppers. Pair with any IPA or Saison on tap and you’ll be moaning out loud at how good it is. If you’ve got “high eyes”, open the pizza box away from you to form a shield so you don’t have to make eye contact with the bartender. All the good ramen places are way too cramped, rushed, and busy to be a good stoner eating experience — except for this hidden gem of a ramen joint, Hida Takayama, located on the second floor of the otherwise deserted Robson Public Market. The specialty is classic Tokyo-style shoyu ramen, which is cleaner and less heavy than the typical tonkotsu-style ramen you find at Santouka, Jinya, and Kintaro. All bowls are $10 or less, and they automatically give you the large serving of noodles for the same price. Best ramen value in town. Seating is spacious here, and you’ll have no problem finding a secluded spot to savour your steaming bowl of noodles in peace. Abdul’s BBQ, located on the Kingsway side of Crystal Mall, does a drier, Syrian style of shawarma that’s all about the taste of the meat. But it’s the supporting cast of rice, tabouli, salad, hummus, pita, garlic sauce, and that killer “secret recipe” hot sauce in the Mixed Shawarma Platter that will make your mind explode. If it’s your first time here, I’d recommend you go for the mild or medium spiciness level. Hot is VERY hot! Best eaten in the comfort of your own home. You’ll be glad you made the effort to go out and buy this. It’s all about simplicity of seasoning and eating them while they’re hot. Advanced level stoner foodies can try their funky Deep Fried Intestines which have a thin, crispy outer layer encasing soft, chewy insides. The most delicious rubber bands you’ll ever eat. After devouring your wings, you can check out the arcade located right in the food court. Any driving game would be perfect. Do not attempt Dance Dance Revolution unless you’re experienced with the game. If you’re feeling cheap, just gaze at the fancy water fountain from the second floor. Super-boring while sober, super-amazing while high. Bonus reward: grab the coveted front seat (aka the stoner’s seat) on the Millenium Line skytrain during the trip home. The world is your oyster — and you just ate it!